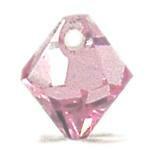 Swarovski - 6301 Beads Bicone Pendants are an Austrian Bicone Pendant. It has the same shape as the bicone beads (5301) but the hole is drilled through the top like a pendant as opposed to through the center like a bead. Order online today!